A picture of the people who voted in the 2018 midterms is starting to emerge, and it offers a template for who Democrats will need to reach ahead of 2020. Exit polls found that voters were younger and less white than the 2014 electorate, but older and whiter than the group that turned out in 2016. Exit polls have historically been unreliable in capturing the demographic composition of the electorate, so the main exit polling consortium changed its methods this year to mitigate the problem. That creates a new problem — you can’t compare this year’s exit polls to past years. 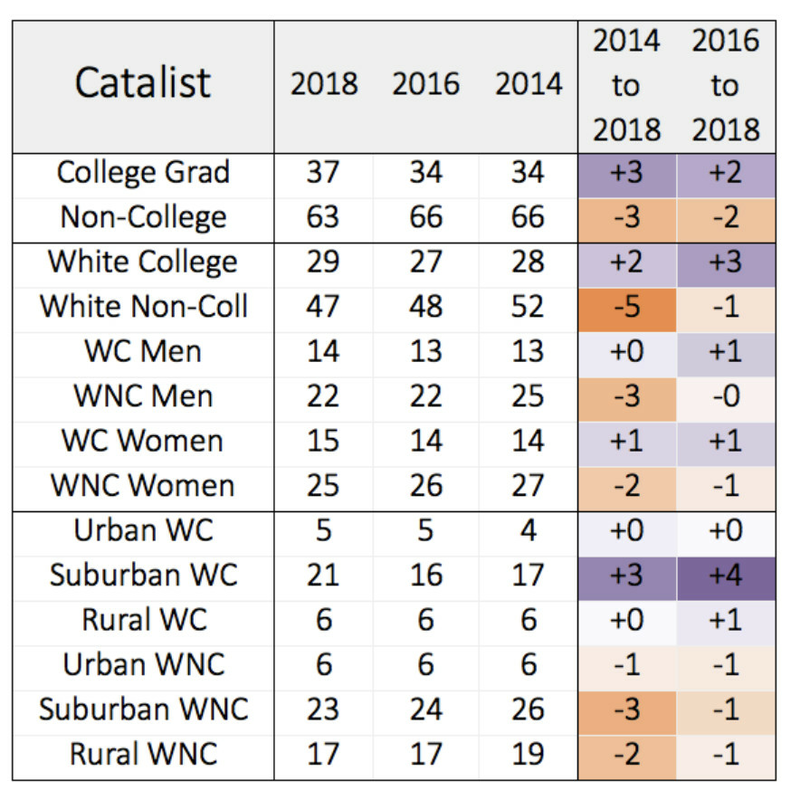 Fortunately, Catalist, a progressive data vendor company, developed a new methodology for estimating the composition of the electorate that gives us demographics that are both accurate and comparable. This means Democrats improved on their 2014 performance in terms of youth and minority turnout. But they were unable to overcome the normal dynamic by which the midterm turnout slump disproportionately impacts young people and nonwhites. If Democrats could get the same kind of results they had in 2018 but with a more typical presidential election electorate, they might do even better in 2020. The education story, by contrast, looks a little different. With college graduates making up 37 percent of voters, it was the best-educated electorate of all time. And the non-college educated whites who form the base of the Republican electorate fell to “only” 47 percent of voters. That’s in part a story about turnout, but also simply a story about demographic change over time. The overall American population is getting a little less white each year. And among the white population, younger people are substantially better educated than older ones, so the natural progression of the life cycle tends to reduce the non-college educated white share of the population. Regardless, even at 47 percent, the white working-class share of the electorate is very large. Conventional exit polls tend to overestimate the non-college educated white share of the population. And since non-college educated whites are relatively rare on the ground in New York and Washington, DC — where the political and media worlds are based — it’s easy to fall prey to the illusion of believing the exit polls. Also note that even though “suburban” is often used in a political context as a kind of shorthand for upscale whites who may be leery of Trump’s culture war politics, even in the where suburbs non-college educated whites outnumber college graduates. Democrats don’t need to win this demographic to win elections by any means. But the exact margin of defeat makes a big difference even as the white working-class share of the electorate shrinks.